Show how much your team mean to you when you wear this Warriors 7s 2018 Players Issue Polo Shirt from VX-3. 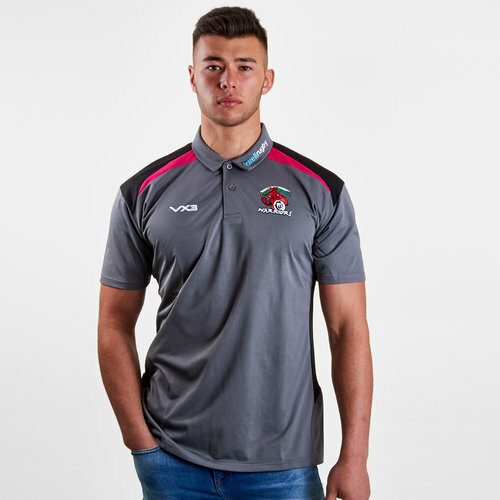 Made from a soft blend of 60% cotton and 40% polyester, this Warriors polo shirt makes for great casual wear all year round. Whether at the match or simply around the home, you can be assured of a great feel and look that you will be proud to pull on any time. It has a collar and 3 button p;lacke5t for the classic look. This polo is grey with black and pink features. The VX-3 logo is on the right whilst the club badge is on the left. The team's sponsor - lovellrugby - is printed on the left side of the collar.